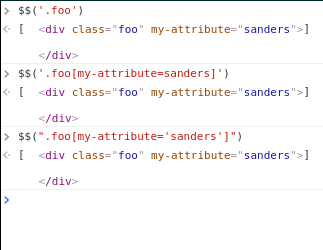 In our project, there is a different functionality when one Dollar sign used $() in Chrome console vs two Dollar signs $$(), besides the known difference that $$() return an array an $() return the first element. What is the source and explanation for this behavior? There are a few shortcuts for selecting elements. These save you valuable time when compared to typing out their standard counterparts. 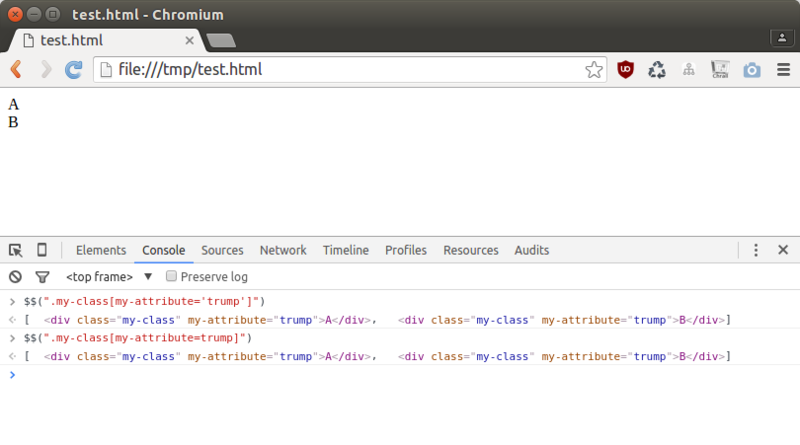 $() Returns the first element that matches the specified CSS selector. It is a shortcut for document.querySelector(). $x() Returns an array of elements that match the specified XPath. When you use querySelector (or $), the result is an element or null. When you use $$, the result isn't an element but an Array which can be easily iterated over. This differs from the native querySelectorAll where it returns a NodeList which is slightly harder to go over all the entries. Conclusion: It's useless to quote trump. You might also end insane. What is “$” in Chrome console?